Air Canada no longer operates Aeroplan, its own loyalty program, but it still offers plenty of great redemption options. There were significant changes to how miles are valued in recent years following the spinoff, yet you can find great value if you know where to look and what to book. For instance, Aeroplan still allows stopovers and open jaws, which are a great way to increase award ticket value. And it has a round-the-world in business class fare for just 300,000 miles. Read on for more details. The most common way — besides flying — to earn Aeroplan miles is by transferring them from Membership Rewards. They can then be used on Air Canada or a variety of Star Alliance partners. Aeroplan has a reputation for collecting additional carrier surcharges on most international awards. Fortunately there are many exceptions that we explain below. Aspirational awards presented here provide a chance to leverage Aeroplan so you can take advantage of stopovers and more easily book Star Alliance partner awards even if you don’t have miles with United MileagePlus (perhaps the best Star Alliance award program). You might not be in a position to pay thousands of dollars for some of these tickets, but by using miles instead you don’t have to. These award redemptions will give you with a sense of just how rewarding frequent flyer miles can be. We looked at real flights at least six months in the future to avoid the higher prices you might find just a few weeks before departure and deducted the cost of the carrier’s fuel surcharges, if any. We then compared this to the number of miles required to book the same itinerary. Dividing these two numbers results in a metric called “cents per mile,” or CPM, that reflects the value your miles provide. Stopovers enable you to visit a city on the way to your final destination, perhaps spending days or weeks before completing the journey. Ultimately you get to visit multiple destinations for no additional cost. That stretches the value of your miles even further. Open jaws can provide a similar benefit since you return to a city in the same general region but not the same as where you started. (The open jaw can also be at your destination instead of your origin.) Aeroplan permits travelers to book different combinations of stopovers and open jaws depending on their destination. On the shortest flights within Canada or between Canada and the United States, members can book round-trip awards with either one stopover or one open jaw. When traveling between Canada/United States and anywhere else in North America — including Central America, the Caribbean, and Hawaii — members are allowed one stopover and one open jaw. If the itinerary is for travel exclusively on Air Canada, then two stopovers and no open jaw may be chosen instead. Finally, intercontinental travel on any carrier provides a choice of either one stopover and one open jaw or two stopovers and no open jaw. In no case are stopovers permitted when booking one-way awards. Keep the above guidelines in mind if you plan to book the following awards or any other travel using Aeroplan. Stopovers and open jaws have historically been the most powerful way to increase the value of your miles. Aeroplan provides access to award space on dozens of Star Alliance partner airlines — not just Air Canada. Many of those have carrier surcharges that are passed along to the passenger when booking an award ticket. The exact amount can vary, and some routes or airlines have especially low surcharges. However, Aeroplan does have a rule in place that protects you from these surcharges on certain airlines. Regardless of the surcharge amount, Aeroplan will waive it entirely if you fly on Air China, Brussels, EgyptAir, Ethiopian, EVA Air, Scandinavian, Singapore Airlines, SWISS, Turkish Airways, or United Airlines. Notice that surcharges still apply if traveling on Air Canada; these may be waived if you are a Super Elite member going to Europe. In some of the examples below, we’ll deduct surcharges from the cost of a ticket when we try to calculate the value of your miles. That won’t be necessary if the itinerary includes travel on one of these special airlines. Traveling with children can be stressful, but it’s also a great experience for them (and helps you get out of the house). Children who are still under two years of age can usually sit in your lap, but most airlines require you to pay for the privilege. That may be as much as 10% of a full-fare ticket — easily $500 or more for business class awards to Europe or Asia. Aeroplan is one of the cheapest programs for booking infant award tickets so you can bring your children with you on your next trip. In economy class you’ll pay just $50 or 5,000 miles. That increases to $100 or 10,000 miles for business class and $125 or 12,500 miles for first class. Many travelers want to fly from North America to Europe, and in business class you can actually get some rest thanks to lie-flat seats. This example of a nonstop flight from Los Angeles to Frankfurt normally costs $5,931 but is only 110,000 miles when booked through Aeroplan. Deduct the $856 carrier surcharge to get a better estimate of the true value your miles provide — roughly 4.6 CPM — and don’t forget to add one or two stopovers to explore evne more of Europe for the same price! One of the more unique awards, flying from Hawaii to South America costs only 80,000 miles and is a relative bargain. Had you started in the continental U.S. it would be a much more expensive 110,000 miles. 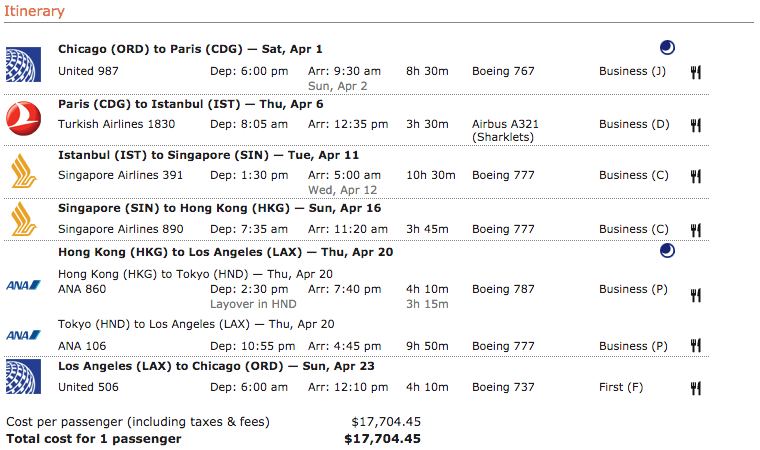 This example from Honolulu to Buenos Aires in business class has no carrier surcharges since United Airlines is exempt. Expect to get 5.7 CPM. 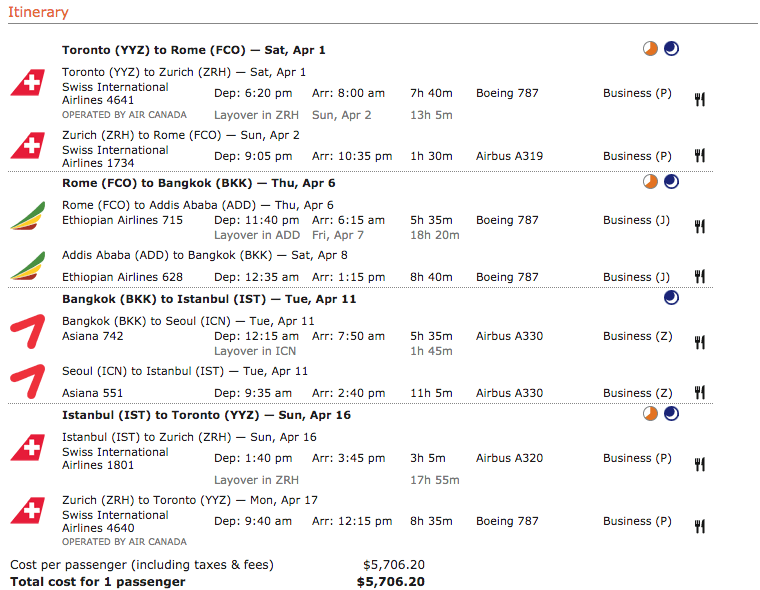 Round-the-world itineraries booked through Aeroplan aren’t as impressive as some others, permitting only five stopovers. Even Miles & More allows more than that. However, remember that you don’t have to pay carrier surcharges on the majority of airlines along the way. It’s also a much better value in business class than it is with some other loyalty programs. This example includes stops in Paris, Istanbul, Singapore, Hong Kong, and Los Angeles. You may be able to add Tokyo to the list and skip the stopover in Los Angeles if that doesn’t appeal to you, or pick any other combination of five cities. Still, the value is obvious. The only surcharges that apply to this itinerary are $204 for travel on ANA. After deducting that from the total fare of $17,704, you can redeem 300,000 miles at a value of 5.8 CPM. As an alternative to round-the-world itineraries, you can book this round trip award with two stopovers in Rome and Istanbul on your way to Bangkok. That achieves almost the same result, hitting three cities for the price of one. Even though a normal ticket costs $5,706, there are only $98 in surcharges from travel on Asiana that will be passed on to travelers booking an award ticket. Redeeming 125,000 miles provides an excellent value of 4.5 CPM. Travel to Australia is even better when you can avoid the carrier surcharges by booking travel on United Airlines and enjoy the more comfortable economy class on its Boeing 787 Dreamliner fleet. This sample itinerary from New York to Sydney costs 90,000 miles in economy class. Sure, it’s only returning 1.3 CPM, but you can sunbathe on Bondi Beach even if there’s still slush in the streets back home. Move up to business class for 160,000 miles round trip. You can’t travel much further from San Francisco than to go to India, on the other side of the world. But it’s more affordable using miles. Despite a carrier surcharge of $498, this award costs only 150,000 miles and returns a value of 1.9 CPM. Plus, one benefit of connecting in Canada instead of Europe is that you can enjoy pre-clearance for U.S. customs and immigration on the trip home. Lufthansa’s first class cabin is considered one of the best for travel to Europe. Some aircraft are configured with a separate seat and bed, and on the return journey you may be able to visit the dedicated First Class Terminal at Lufthansa’s Frankfurt hub. Booking this award tends to be easier using Lufthansa’s own loyalty program, Miles & More, since Aeroplan only gains access to award space two weeks before departure. However, it’s much easier to accumulate Aeroplan miles through other programs like Membership Rewards. A round-trip ticket in first-class normally costs $14,833 but can be booked as an award for 140,000 miles. Even with a carrier surcharge of $856, this still delivers an excellent value of 10 CPM.